Email us a writeup of your trip to Greece & we'll send you a travel voucher to discount against the cost of your next one! There are some pretty cheap flights to Greece at the moment due to the country's financial turmoil, and even if it doesn't seem like it, this is probably the best time to visit Greece! You don't have to worry about violence or protests on the Cyclades, they are a world apart from the city life in Athens and the mainland. On the islands, you can simply relax and enjoy life very slowly. There are many airlines you can choose from, for instance Egyptair, Turkish Airlines and Qatar Airways. 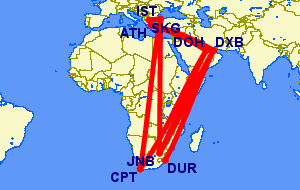 Should you want to fly from Cape Town to Athens instead, not a problem. You can fly with most of the airlines mentioned above for a fair price. Flights to Greece may be disrupted/cancelled on the 6th Nov 2013, due to a 24 hour strike, including a 3 hour walk off by air traffic controllers from 12h00 to 15h00. There wont be a metro connection to the airport, and ferries/trains wont operate. Carol Clifford explains how calamari in Greece may be a bit different to what you're used to from South Africa. Ten years after my original trip as a student, I went on holiday to Greece with my husband and 3 year old daughter. We flew ELAL to Israel and then Olympic air to Athens, (both airlines keeping my youngster very well entertained - to my relief), from which we then decided to set out and explore some of the smaller islands. 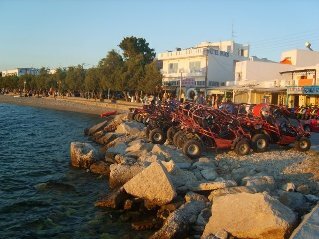 Our island visits included Hydra, Spetses and Rhodos. It was whilst we were on one of these islands that we learnt the 3rd lesson of travel, one that I think has taken many tourists by surprise, and that is that: “The local cuisine of a country may differ somewhat from what we experience at home.” One sunny day we decided to eat lunch at one of the local restaurants on the waterfront. Because we all enjoyed eating calamari, we ordered squid and a Greek salad off the menu. Well, imagine my horror when, instead of some deep fried calamari rings fried in batter, we received a bowl of roughly chopped up, pickled octopus with its tentacles and suckers intact, looking remarkably like the dead octopus we had witnessed a local resident slapping against the pavement as we had made our way to the restaurant. This was accompanied by tomato wedges, olives and feta swimming around in a bowl of olive oil, without a lettuce leaf or a slice of cucumber in sight. This I assumed was the Greek salad. I couldn’t bring myself to eat the octopus, and neither could my husband, so we picked at the salad, whilst my voracious little calamari addict, totally unfazed by the ugly octopus suckers, devoured two-thirds of her meal with great abandonment. For Carol's first 2 lessons in travel, see why bags must have wheels, and when in Austria do as the Austrians do! 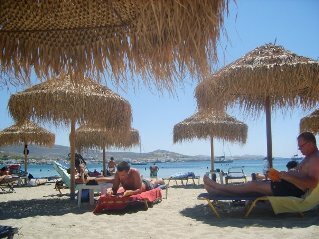 The Cyclades group of islands is one of the most beautiful holiday destinations I have ever visited. Have a quick look at these photos and you will see that most of them are in vivid shades of blue, the colour of the warm Mediterranean Sea. A few years back I decided to do some island hopping with two of my best friends, and we had a fantastic time! The preferred mode of transport between the islands is hydrofoils. They hover above the surface of the sea & are very quick, much faster than the massive ferries. They can take hundreds of cars and people. After flying into Athens, we frantically ran around, looking for a taxi to take us to Athens Port. This massive, floating village would take us from Athens to Mykonos, our first island on our visit to this ancient realm of Earth, home of the Greek Gods. Sadly, we didn't have time to explore Athens and the majestic Parthenon, so I will have to go back! What a start to the holiday - we booked into our beach hut and settled into the fantastically stocked beach bar. If you are into parties, Mykonos is a good stop for you. We befriended some locals and they introduced us to the locally made drink, ouzo (tastes like liquorice). You can see a nice picture below of someone who enjoyed their ouzo a bit too much. 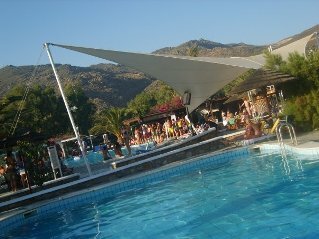 There were many beach clubs pumping till the early hours of the morning. Just beware of the sand fleas, I had about 100 bites on both my legs and it looked horrific - people were staring! Another word of warning, do not step onto the reefs without some kind of shoe. I climbed up on one, prancing around as if walking on water, and as I dove off, one of my toes nearly got severed. Yes, it's that sharp (Ed: on my holiday to Vilankulo I had a similar experience, cutting my fingers at Magaruque Island - reefs are sharp!). I watched curiously as tiny little fish started to swarm around my bleeding toe as one of my friends bolted to the bar to get some plasters. The injury was so bad, I had to go for a tetanus shot at a Greek hospital. Nobody could speak English and it was quite interesting trying to get the lady to understand my ramblings. It turned out that I couldn't swim for the rest of my holiday and I was completely devasted. My good friends were staring with open mouths at the handsome Greek doctor, one upside of having to go to a Greek hospital! The following morning we caught a hydrofoil to Paros. This island is much more chilled out and almost had a "retirement village" vibe to it. It was really nice to have a breather from all the partying, so we didn't mind. One of the best and cheapest modes of transport is the scooters, you can hire them from anywhere and it is really great for seeing the whole island, fairly quickly. Don't miss the Church with a Hundred Doors. You can lose hours walking or driving around the alleys, untouched by fellow tourists. 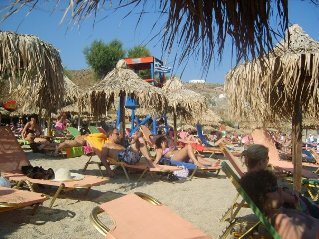 You will probably see that many of the beaches look similar, with their little grass roofed umbrellas. You will be happy to know that you can rent chairs and umbrellas for a day - it wasn't that expensive and is certainly worth it. The sun is rather unforgiving and you need to take care not to burn to a crisp - a long sleeved cotton shirt is a good idea! We caught our next hydrofoil to Ios, Greece's official party island. Since my toe was still in recovery, I wasn't really able to join in the party fun, but I did enjoy several cheap and delicious cocktails next to the party pool. Funnily enough, I started to notice several people with plasters all over their feet, seems like I wasn't the only silly banana out there. Ios' beaches have been voted into the Top 10 best beaches in Europe, so if you're not into all the partying in Hora, the centre of Ios, you can simply chill and top up your tan. We had to cut our visit to Ios short by a day, when we realised that the ferry took 8 hours from Santorini to Athens, our final stop. We would never have made our flight in time! It was only later that I found out that you can in fact fly out from Santorini's airport, how embarrassing... It was time for our last hydrofoil trip to Santorini. Santorini is my favourite Greek island. Not only was it completely breathtaking, but it had the right mix of culture and party atmosphere. The black, volcanic beach was unusual and very tempting, but we decided to catch a bus around the island instead and visit the village of Ia. 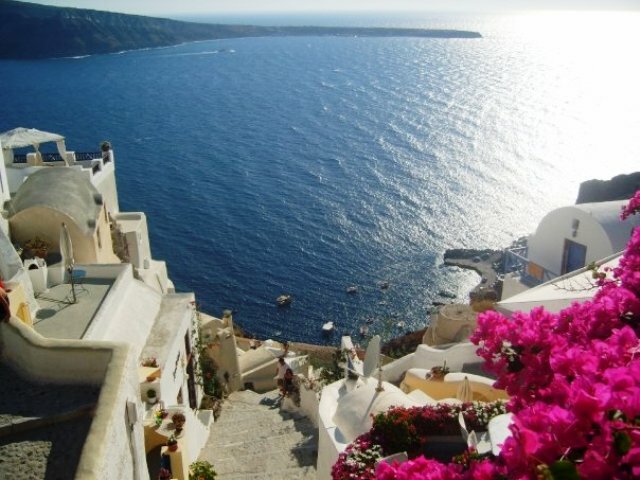 Whenever you see a picture of a Greek island, it is Ia, trust me (also written as Oia). 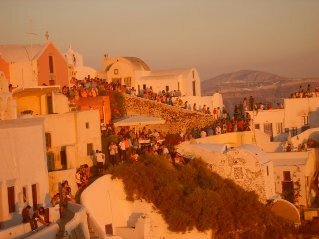 Tourists line up every night to view the sunset, and will proceed to clap enthusiastically when the sun finally sets. You might think this is odd, but when you see it, you will understand. 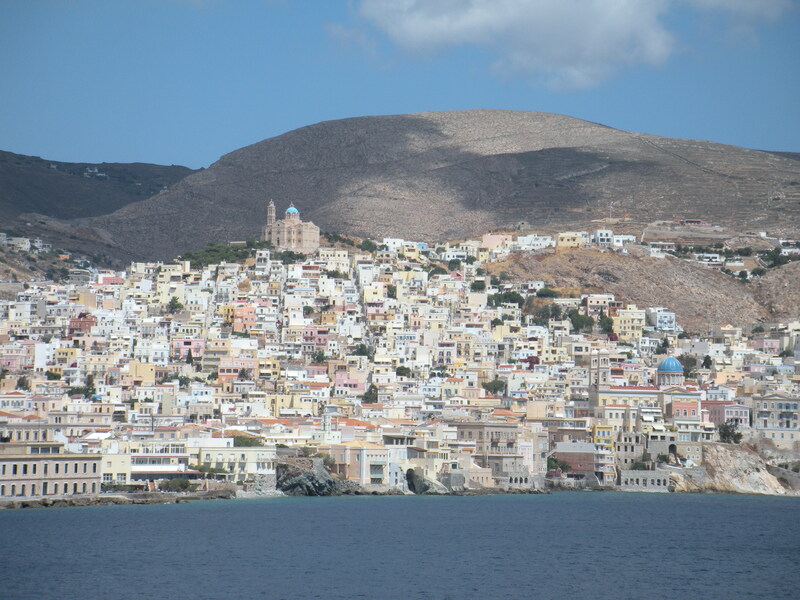 As we approached Santorini by hydrofoil, we first thought there was snow up on the cliffs, until we realised that we were staring at crisp, white buildings. I love the ancient feeling I got from this village, you could still see some of the original city walls, with derilict buildings around every corner of every steep alley, it was simply incredible and I couldn't believe that I actually had to leave at some point. You can go and climb the very active volcano on Karmeri island if you like, or simply enjoy the black, pebbled beaches. We had some incredible meals in Greece, my favourite was our second last meal in Santorini. We had platters of vegetarian delicacies, rice wrapped in vine leaves (dolmades), various kinds of cheese and bread, and I dare say, Greek wine isn't half bad! 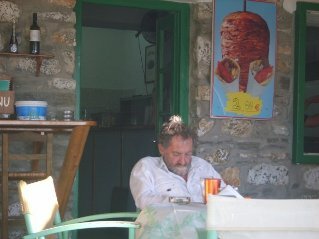 You should also sample the gyros on the islands. They were a firm favourite with us while on the run, thinly shaved chicken, lamb or beef wrapped in flatbreads with salad - delish! You are spoilt for choice when it comes to accommodation. We alternated between the bare basics and luxurious comfort and I found this to be the perfect balance. You get to experience the true island life and the more priviledged side of things. 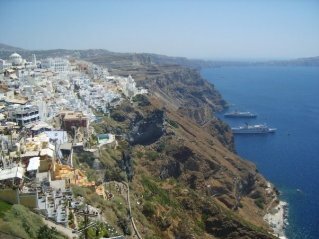 I have found an excellent travel blog covering the Cyclades and all things Greek, written by Matt Barrett. It is very informative and a must read before you head to the Med. Dec 2011. Brendan tours Athens during protest marches - on his way back from the Acropolis he spots this street art. Greek is the official language of the country.